It’s a common problem among online marketers and online content publishers – having their content scraped or copied, used on a different site, and then being outranked by these sites. While Google continues to improve their algorithms to detect original content more accurately, they are providing a new tool that can help you with this complaint: the new Google Scraper Report. The tool’s aim is to collect more information about scrapers that copy content. The form is simple, as you can see from the image above. You’ll need to provide the content source URL, the URL of the scraper site, and the URL of the Google search you ran that shows your original content has been outranked. Note that Google will require you to confirm that your site follows Webmaster guidelines, and that you have no existing manual action penalty in their system. There’s no word from Google on whether they’ll be fixing the problem themselves and immediately when they receive the report. From what we can see, it’s a tool made to collect more information, which Google may address directly while using the information to improve their algorithms. If (and when) they do use this data to improve their ranking system, the rankings will be corrected to reflect which is the original content and which pages contain scraped materials. 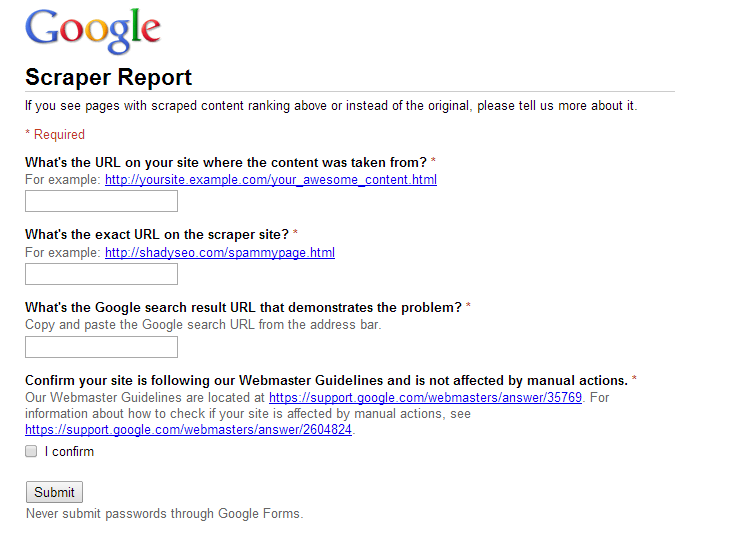 This Scraper Report tool does have one slight catch: since anyone can submit scraping reports, those who actually own the rights to a piece of content may be reported by spammers as the “scrapers.” However, Google’s multiple aggressive algorithms such as Penguin, Panda and Hummingbird will help detect which sites are spammy and which is the original source of the content in question. In the meantime, this new tool will help Google refine their ranking algorithm and alert them when someone steals your content. Talk to us today if you feel your content has been scraped. We’ll run an audit to find the scrapers and help you develop a strategy to ensure your campaigns maintain good rankings on the SERPs. Sign up now and become our partner to get started.